Bill Marler, a prominent attorney specializing in foodborne disease, named restaurant chains and a produce distributor in the June 1st edition of the newsletter Food Safety News distributed by his law firm Marler Clark. The Food and Drug Administration has not released the names of restaurant chains implicated in the outbreak involving a specific E.coli O157:H7 producing Shiga-like toxin (STEC), neither has the Agency identified distributors or processors in a complicated distribution chain. Only one direct link was confirmed between a cluster of cases in a jail in Alaska and a specific farm in the Yuma Valley. This was outlined in a release issued under the signatures of Dr. Scott Gottlieb, FDA Commissioner, and Dr. Stehen Ostroff, Deputy Commissioner of Foods and Veterinary Medicine. Since Marler Clark LLP represents over 100 clients in this outbreak involving close to 200 confirmed cases in 32 states, they have access to statements by affected diners and the Firm has independently initiated traceback studies with data obtained voluntarily and by subpoena. The restaurants concerned include Panera Bread, Texas Roadhouse, Red Lobster and Papa Murphy’s. Fresh Way Foods is a processor identified by Marler Clark LLP. Bill Marler justifiably questions why the FDA has been reticent to release the names of restaurant chains, processors and retailers. In an earlier editorial, Marler acknowledged the expressed need by the FDA to balance the responsibility of maintaining a pathogen-free food supply and the financial interests of producers and retailers. Given a foodborne outbreak of long duration with potential life-threatening consequences, the unwillingness of the FDA to release information represents a danger to the public according to Marler. It is noted that in the case of the Salmonella Branderup case, the FDA revealed the name of the company operating the North Carolina egg production complex and brands packed for supermarket chains although epidemiologic investigations were incomplete. EGG-NEWS supports the principle of releasing information on sources of contaminated foods and brand names but only if this is in the public interest and if epidemiologic studies hopefully including whole genome sequencing clearly identify the source of infection and especially if recalls are implemented. *n=197 for whom information was reported as of May 30, 2018. 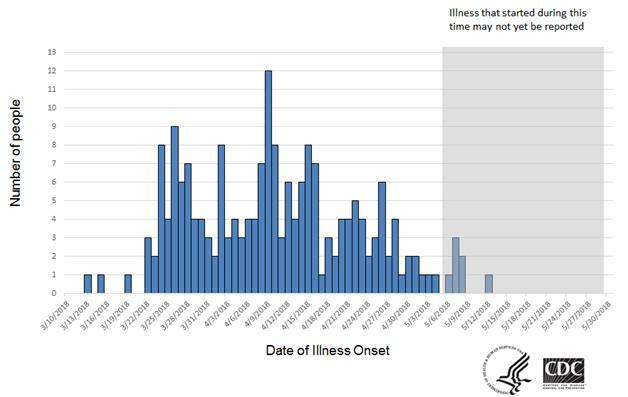 Some illness onset dates have been estimated.